Direction Choices - The Y Store sits in the middle of the "Y" intersection of Hwy 5 and Hwy 177, hence the store's name. At this intersection you have two direction choices. No matter which way you go, you can easily pick up the main tour loop again. Turn left onto Hwy 177 and it's 1.5 miles to the Norfork National Fish Hatchery, Dry Run Creek, and lower Quarry Park. Go another one-half mile to upper Quarry Cove Recreation Area on top of Norfork dam. From the dam you can simply come back down Hwy 177, and behind and past the Y Store, and continue the main tour loop down Hwy 5. Or you can continue on to Jordan Park at point 2A. From Jordan Park you can pick up the main tour loop again at Point 6 Jordan Road. All side trips are short drives. About The Y Store - It's in Salesville (pop. 440) across the Highway from the fire station and town offices. For years this independent Mom & Pop convenience store has been a favorite with locals and tourists. It's a landmark for highway directions. Selling groceries, ice, snacks, gas, bait, licenses, and tackle, it's also a good place to meet locals and fishermen. Open seven days a week at 10842 Hwy 5 South, Salesville, Arkansas (zip code 72653). Phone: 870-499-5352. Intersection of Hwys 5 & 201. Turn here onto Hwy 201 to run tour backwards. Run the tour backwards if you are most interested in hiking, walking, birding, ATV use, or running back roads. This is also the most popular direction for motorcycle and sports car groups. Go down Hwy 5 about 2.1 miles from the Y Store. Turn right (east) onto Hwy 201. Go 1 mile, turn left onto Highway 341 (aka Push Mountain Road). Great for fall foliage color and spring dogwood and redbud blooms. Push Mountain Road Hazard Warning! Because of it's sharp curves it is important that you always stay in your lane on this road. Your life, as well as lives of others, could depend on it. For your safety and that of others, please stay in your lane at all times. What Else Is At Point 1? Lake Norfork Liquor Store is just up the road a few hundred feet from the Y Store. They are open seven days a week from 8am to 10pm except Sundays when open from 10am to 10pm. They have a wide selection of beer, wine, and liquor including legal Arkansas Moon Shine. Fire Station & City Hall - Across the road from the Y Store is the fire station and City Hall for the town of Salesville. Pull over here for Goat's Ridge overlook. Be careful! Goat's Bluff Scenic Overlook - Dangerous! BE CAREFUL- No Safety railings 1.8 miles down Hwy 5 from Y Store look for a short opening in the guard rails on your left. You'll see a rough pullout large enough for two cars at the most. Walk about 30 feet behind the "No Dumping Allowed" sign and you'll be standing on a high bluff looking straight down into the North Fork River. 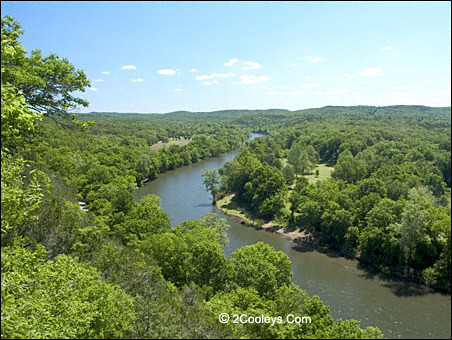 It's also a panoramic view of the Ozark hills. The story goes that many years ago goats from a local farm used to shelter under this bluff. When pulling back out onto the highway look both ways. Longer RVs will not want to stop here. Motorcyclists watch it, take it easy in the ruts. We added this because so many people ask about it. If you stop, we say it again: Be VERY careful pulling in, pulling out, and standing on the bluff.